Over 600 people, including diplomats, journalists, musiclovers, Azerbaijanis and friends of Azerbaijan have attended a landmark classical concert to commemorate the victims of the Khojaly Massacre. The concert was organised by the Azerbaijani Embassy to France, the Paris branch of The European Azerbaijan Society (TEAS) Foundation, the Ulduz Association and the Association des Amis de l’Azerbaidjan. History is always the subject of debate and interpretation, and this evening’s commemoration is not intended to stir tensions, but to ensure that such atrocities are not repeated. 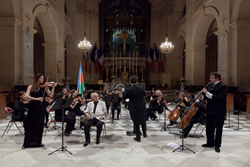 On 25 February, a moving classical concert took place amidst the stunning 17th century classical surroundings of Cathédrale Saint-Louis des Invalides in Paris – the cathedral for the French armies – in commemoration of the victims of the Khojaly Massacre in 1992. This was the worst single atrocity of the Armenian–Azerbaijani conflict over Nagorno-Karabakh that claimed the lives of 613 civilian victims in 1992, including 106 women, 63 children and 70 elderly people. The evening was attended by more than 600 people, including Senator André Reichardt, President, France–Caucasus Group, French Senate; composer Pierre Thilloy; André Sadry, Secretary, National Association of the Families of the Martyrs of Oradour-sur-Glane, and many Ambassadors, including HE Anar Karimov, Ambassador and Permanent Delegate of Azerbaijan to UNESCO; HE Anguel Tcholakov, Bulgarian Ambassador to France; HE Homidjon Nazarov, Tajik Ambassador to France; HE Rasa Mikiclaité, Lithuanian Consulate; HE Calixte Madjoulba, Togolese Ambassador to France; HE Patricio Hales Dip, Chilian Ambassador to France; HE Jean-Paul Guevara Avila, Bolivian Ambassador to France; Adil Embarch, Councillor from the Morrocan Embassy to France, and HE Ali Ahani, Iranian Ambassador to France. The concert was organised by the Azerbaijani Embassy to France, the Paris branch of The European Azerbaijan Society (TEAS) Foundation, the Ulduz Association and the Association des Amis de l’Azerbaidjan. H.E. Elchin Amirbayov, Azerbaijani Ambassador to France, said: “Up to this day, this massacre sadly remains unknown by French society and constitutes the most terrible episode in the conflict between Armenia and Azerbaijan. The extent of this massacre is comparable with that in Oradour-sur-Glane during World War II, which has left indelible traces in the memories of our French friends. This massacre, which was intended to provoke panic amongst a fleeing population, was followed by a policy of ethnic cleansing, which saw almost a million Azerbaijanis forced to leave their historic territories, whilst Nagorno-Karabakh and the seven surrounding regions were occupied, accounting for around 20 per cent of their country. Marie-Laetitia Gourdin, Director, TEAS France, said: “I would like to thank our partner organisations, with whom we are associated this evening, under the communal banner of the international Justice for Khojaly campaign. It is an honour for TEAS to be represented at the prestigious Cathédrale St-Louis des Invalides to render homage, together, to the memory of the Khojaly Massacre victims. “History is always the subject of debate and interpretation, and this evening’s commemoration is not intended to stir tensions, but to ensure that such atrocities are not repeated. The tragedies of today should not cause us to forget those of yesterday. The millions of refugees today must not make us forget the approximately one million Azerbaijanis who have been waiting for more than 20 years to regain their lands that are still occupied by Armenian troops. L’Orchestre Lamoureux, under the baton of Azerbaijani conductor Ayyub Guliyev, performed the concert. This orchestra is well-versed in playing Azerbaijani classical repertoire, as the Artistic Director is Pierre Thilloy, Director-General of the Festival De Soie et de Feu (Of Silk and Fire Festival) and former Composer-in-Residence for the French Embassy in Azerbaijan. It aptly began with the Funeral Ode by Gara Garayev in the arrangement by Mustafa Mehmandarov, and also included Azerbaijani works by Vasif Adigezalov and Fikret Amirov. European pieces included the 'Dream of Mengele' by the composer, clarinettist and writer Hélios Azoulay, a disturbing work inspired by the hideous, sadistic experiments of Josef Mengele on inmates of the Auschwitz Concentration Camp; and the Adagio for Strings by Samuel Barber, a poignant and emotional piece featuring a gently ascending and descending melody that is frequently performed at funerals. The commemoration concluded with a performance of the tone poem 'Khojaly 613' by French composer Pierre Thilloy, played in the presence of the composer, featuring Azerbaijani violinist Sabina Rakcheyeva, the first Azerbaijani graduate from the Juilliard School in New York and Cultural Advisor, TEAS, and Hélios Azoulay on clarinet. The evening was dedicated to the memory of the Khojaly victims and those Azerbaijanis who have one wish – to return home and live in peace with their neighbours.